A few weeks before setting off to Rome I’d read a few amusing news stories about ‘gladiator fights’ happening outside the Colosseum. 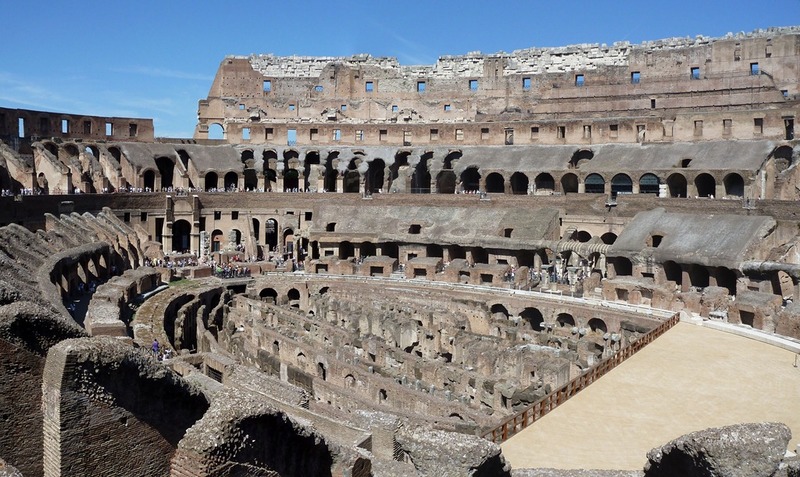 Apparently the gladiator impersonators had formed gangs and were using violence and intimidation against other would-be gladiators, as well as against tourists to force them to pay up for photographs. In response, the Italian police sent in agents, undercover in gladiator costumes and togas. Sure enough, a ‘sword fight’ did ensue, other undercover police then stepped in to make arrests as reported by The Guardian and the BBC. There was no such drama when we visited the Colosseum and Forum, though the gladiators were around and not looking authentic at all. We avoided being coerced out of our money anyhow, though we did in the end decide to dodge the queue by signing up for a tour. The system was very much geared for tours. By buying a ‘large group’ ticket, the tour guides paid a much reduced cost per person, so some of them charged a very similar price for a guided tour as was charged for a normal ticket but could still have made a profit even on that. On top of this, for just a few euro, tourists could effectively skip the queue. 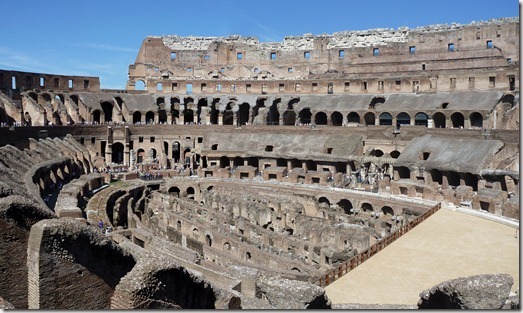 This was the case in the Forum, the Colosseum and even in the Vatican. There’s not much I can say about the Colosseum that you shouldn’t figure out for yourself from a decent google search and a decent documentary on the Romans, but the impressiveness of the scale of building is something that must be seen first hand to be appreciated. I can add that to my surprise, the Colosseum underwent a conversion fairly recently to a) bear the name of a Pope who restored it, b) include a chapel and c) be set up for the stations of the cross. Enter Gelato Numero Treis. Dark dark dark chocolate fondant and Baileys. 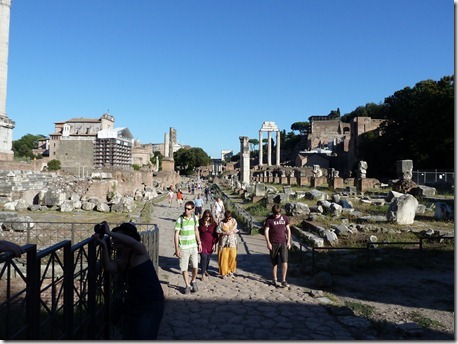 Next up was the Forum, an eccentric mix up of rubble. There was an impressive capacity for recycling, a temple had been recycled first as a basilica and then as a church vestibule. Even the smaller fragments of ancient marble had been recycled, proving useful as foot stools and resting spots for tourists. So plentiful is the priceless heritage, that you don’t even feel bad resting muddy feet on them. The tour guide for the forum was surprisingly informative, though he did insist on ‘tour guide bant’ which I find one of the most painfully cringe worthy experiences. I did appreciate his explanations of where things were missing, “and that, is in the Vatican.” or “on your left you would see this – but it’s currently in the Vatican.” It was surprisingly refreshing to discover that “the death place of Nero, not the forum but a palace, is now a cat sanctuary.” We passed by the cat sanctuary later on in the week, supposedly all hundred or so cats have been tested and vaccinated, given their freedom to wander the city though, I wouldn’t have taken my chances with any of them. Rome perhaps has a problem with animal disease, not just cat FIV AIDS but also rabies, the ‘dog police’ for want of a better description had sirens, so I’m assuming something justified them. Rome had a great many different types of place, on one embassy entrance we counted at least 4 different forces. Not a particularly efficient way to run things. The police were allowed to smoke while on duty too, something my dad had to point out before I noticed, but having noticed it I would now agree there was something slovenly about it. Questioning the Coalition narrative of Labour’s profligacy and cuts’ necessity. Isaiah Berlin said that people can be divided into two categories of thinkers, summarised thus by the Greek poet Archilochus. This aphorism is easily observed by anyone who chooses to question government policy. Take Student Fees. Ask why the cap on fees has been tripled and you will be told that the government can no longer afford to fund higher education. Ask why higher education funding must fall and you will be told it is to tackle the deficit. Ask why deficit reduction is priority and you will be told, “we’re having to make difficult choices to clean up the mess left behind by the party opposite” Honestly, I didn’t even bother looking for an exact quotation of that message, it has been repeated so many times in so many different (but the same) iterations that I can simply make it up and be sure that a coalition minister will have used that variation at some point. The cabinet hedgehogs one big idea, their answer to every question, is that policy x is necessary, because of the legacy left behind by the Labour party. The fact that a political party has one common answer to many questions is not itself damning or a flaw. After all, most political groups share some common ideology, which is essentially the ‘one big thing’ they view the world through. However the current coalition answer is not an ideal or vision, but rather a very practical, pragmatic and ‘facts of the situation’ sort of answer, which I think in many ways makes it very vulnerable as a foundation for policy. Unlike Berlin’s ideological hedgehogs, the government ministers seem to be hedgehogs who only know one small thing. AKA: The mess left behind, the shocking inheritance, the debt problem. This is vital to the argument. What was Labour’s legacy? Whilst the deficit and debt were indeed high by the election in 2010, this was in a situation that according to Vince Cable is the economic equivalent of war. It makes more sense therefore to judge the Labour governments alleged profligacy by their entire time in office, rather than the effects of a recession. 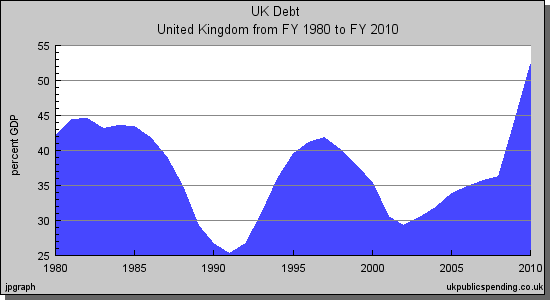 According to the above graph, between 1997 and 2003, Labour had in fact been reducing the debt, through their comparatively restrained increases in public spending and the use of incomes such as the sale of the 3G spectrum to cancel debts. 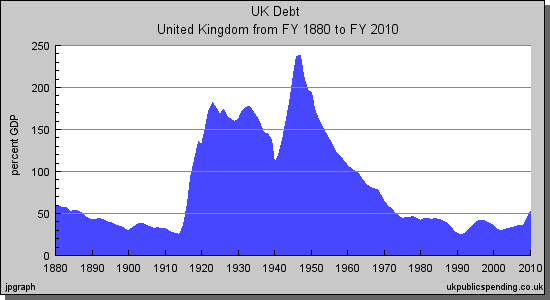 Some notable debts, such as that owed to the US government from WW2, were finally cleared by the Labour government. For those who assume that Labour’s profligacy set in only during the financial crisis from 2008, a fair comparison then would be as Vince Cable says, to a time of war. In the case below, it’s fairly clear that UK Debt is far less significant after this ‘economic war time’ than after the real WW1 and WW2. The facts undermine the ‘inherited mess’ part of the coalition’s “one big idea”, but that does not mean there are no arguments for their course of action, it’s simply a shame they choose to not bother making them. In the case of Student Fees, they could have focused their argument, as some Labour MPs did, on the unfair situation of non graduate tax payers having to fund what are called “mickey mouse degrees” They could even have argued that too many students were doing degrees simply for the sake of qualifications and that a labour market should accommodate more practical displays of experience and skill in the many areas of work where a degree is simply not very useful. In general, a real hedgehog outlook would be if the Coalition could provide a persuasive argument for their big idea that contractionary fiscal policy being a route to economic growth. Perhaps the frontbench do hold such beliefs and arguments but instead choose to force a narrative onto their opposing party. They had better hope their ‘profligate labour’ narrative sticks, because with cuts and unemployment, labour’s ‘thatcherite tory’ narrative for Cameron certainly will.